Yes, kale is a nutritious powerhouse, but did you know that Romaine is another good source of folic acid? It's rich in vitamins A and K. You can mix it with kale or spinach to add more antioxidants. 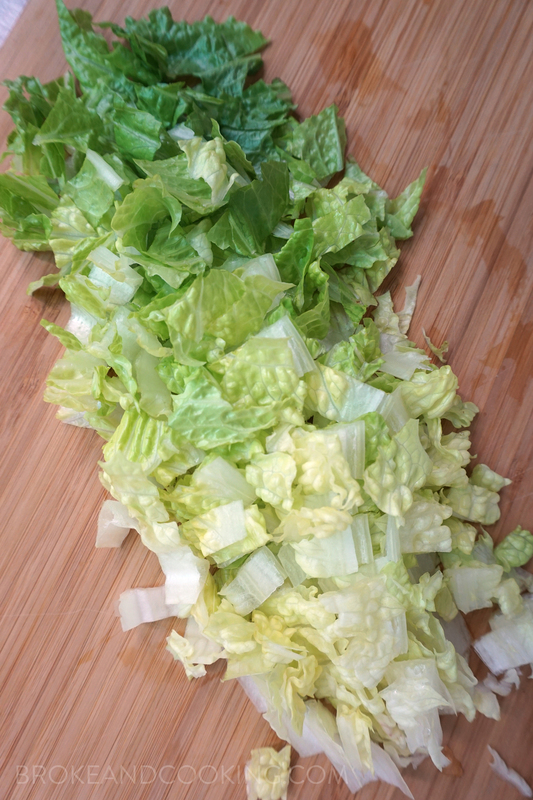 I usually have a head of Romaine in my fridge for quick and easy meals. The creaminess of the avocado is so yummy with the crunch and refreshing taste of Romaine! I love this salad because it can easily be adapted to whatever you've got in the kitchen. Leftover chicken or ham? Random veggies that need to be eaten soon? Throw it in and mix it all up - it's the easiest salad that is packed with flavor. In today's recipe, I'll show you how to top off the salad with a gorg piece of pan-fried salmon, but I love it with chicken, cold roast beef, shredded Costco rotis, or even sliced meat :) Let's get cookin! Optional: other seasonings or toppings such as red pepper flakes, a dash of cumin, pine nuts, almonds, corn, mushrooms, other veggies, etc. Wash and chop up the romaine and tomatoes, and drizzle with evoo, salt, and pepper. Halve the avocado and carefully remove the seed with your knife. Season the avocado with salt and pepper. Using a fork, smash the avocado inside it’s skin. Add the smashed avocado to the romaine and tomatoes, using forks or your hands to toss the salad together, ensuring that all the romaine gets coated in creamy avo. Squeeze the juice of 1-2 limes over the salad. Add tons of torn or chopped fresh cilantro, and mix to combine. The salad portion is done - you can add whatever toppings you like - pine nuts, corn, mushrooms! Season the salmon, face side up, with salt and pepper. Heat a drizzle of extra virgin olive oil in a nonstick skillet over medium-high. When the oil starts to glisten, and a splash of water sizzles and quickly evaporates, place the salmon into the pan, skin-side-UP. Season the salmon skin with salt and pepper, and watch as the salmon cooks quickly. Cook the salmon about 3-4 minutes, or until it cooks thru about 1/3 of the way. Use a spatula to carefully flip the fish. Continue to cook the salmon another 2-4 minutes or until it feels medium-rare to the touch of a fork. The fish should feel firm but still have a little bounce to it. Serve the salad with the protein on top, and a few cracks of black pepper!